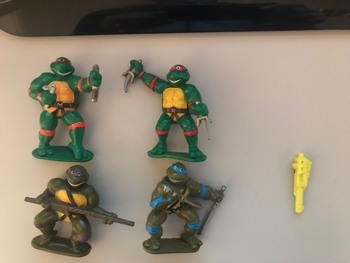 Just wondering if anyone knows the origin (4 pack, promotion etc) of these 90's four TMNT figures and there is also a neon yellow gun that I cant quite ID - thought it was for an AM but no luck. The gun is Actionmaster Bumblebee's. Surely that's Action Master Bumblebee's gun. Can't help you with the TMNT figures. I want to know if you guessed it from your head, wander around your shelves or Google? Also how long it took you after you saw the pic. If Skullcruncher hadn't used the word Action Master I probably wouldn't have recognised it. But seeing that word and the photo it reminded me so much of Bumblebee's gun I had to look up and check that it wasn't his. Pretty much the same for me... I then looked in the Generations book first.